I wasn't born in Cozumel but I became a local since the very first time I jumped into the turquoise water. I was 5. It was love at the first splash. I have dived and snorkeled many spots on the island, however, no one draws me back to those days of awe and fun as the Colombia-shallow reef does. I love SCUBA diving, however it has everything to do with adventure and thrill, at least it is so to me; instead, snorkeling has much more to do with freedom and fun; there are not too many things to worry about, no hassle, no gauges, no dive computers, just fun, and freedom. Several extraordinary conditions converge at the Colombia Shallows Reef to create a healthy environment for the reef biodiversity. Factors such as depth, sunlight, ocean temperature, marine current, geographical situation and even neighboring reefs and lagoon. To better understand its unique characteristics it is necessary to know where it is. The Cozumel reef system It is the most relevant portion out of the second longest reef barrier in the world, after Australia's Great Barrier. The coral system in Cozumel lays mostly, on the western side of the island, however, only a 3-mile long reef strip, right off the southwesternmost coast, is without questions, what actually transformed the island into a world-class destination. Even though this reef strip may be considered as one massive coral "playground" for divers and enthusiasts, locals have named sections of it to better identify their location according to their attractions and diving characteristics. Thus, the three miles comprehend from north to south the Palancar Gardens, Palancar horseshoe, Palancar caves, Palancar Deep, and the Colombia Pinnacles. Between the last two and the coast, is where the Colombia Shallows Reef rest. While all of the neighboring reefs are placed right at the brim of a drop-off, facing the nothingness (by the way, being there below is an experience that makes you feel humble and grateful), the Colombia shallows is in-between a major reef line and a sandy bay beach on a strip which separates the ocean from the Colombia Lagoon, a shallow mangrove habitat after which the reef was named. Because of its location, in-between a mangrove lagoon on the eastern, major reefs on the west and a sandspit on the south, the place is enclosed in a natural barrier which eases the regular high tide and protects the area from eventual storm surges. This is likely why the place is a natural nursery for many species. 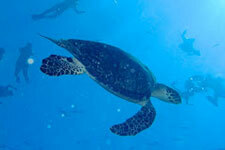 Visitors often report hawksbill turtle sights. 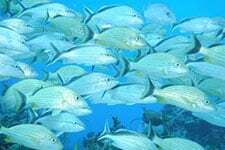 Barracudas, bar jacks, grunts, filefish, and snappers are common to the area. Eventual sights of green morays, octopus, and black snappers of regular size are reported; that is not strange as this heartless predator are often hidden, orchestrating a new quick and lethal ambush. A distinguish seasonal visitor is its majesty the spotted eagle ray. This impressive animal uses to stay around for the winter. This is a place too for young bluish nurse sharks (they become brown when adults, and positively larger!). In spite of its aggressive looking, this mainly crustacean eater is rather sluggish. Coral polyps take advantage of such benefits too; food supply and mild currents improve their development, of course; however, sunlight plays an essential role in their healthy progress. Some polyps develop better than others at certain depths, due to the amount of sunlight. Colombia shallows reef is a garden for Lettuce coral, I may actually dare to say this is the healthiest and largest lettuce coral site on the island. Of course, some other kinds of coral structures flourish here; massive 30' structures raise up from the bottom of the sea. Intricate forms and swim through tunnels are perfect classrooms for numerous schools of fishes. Some other factors contribute to making this an exceptional snorkeling site. The Colombia Shallows is far from everything and is only accessible by boat, thus, distance and inaccessibility screen multitudes. Furthermore, the site is located inside a National Reserve, so navigation and water sports activities are controlled. A license for boats and crews most be issued to operate in the area. Anchor throwing and deep keel boats are forbidden. For visitors, a no fishing, no touching, and no collecting policy applies. Even divers volume is regulated. So, everything conspires to make Colombia shallows reef a superb snorkeling spot. I would even say, the ultimate snorkeling site in Cozumel. There are basically three ways to get there. To charter a private boat for the trip and all the ha$$le involved. To buy a thrilling panga trip to stimulate your sense of adventure. Finally but certainly not less important, you can get there on the "Cozumel Snorkel Tour: Coral Reef, El Cielo & Playa Mia Beach" Tour. I think this is the best value tour as it involves professional guiding, a large snorkeling-customized motor-sailor catamaran vessel. The tour actually does two snorkeling stops, one at Colombia and another one at el Cielo (#elcielocozumel). Drift snorkeling with the current is also quite a satisfying experience. Plenty of water and canned sodas along the trip, and after the snorkeling activities, the skipper calls for opening the bar aboard for free draft beer and margaritas, which are truly welcomed by the time. The boat stops at Playa Mia Beach park on the way back for everybody to refuel with buffet and domestic open bar. After "devouring" you can do either, slip into a deep ‘food coma' by the beach or explore around for a while as the park features a lot of beach toys and attraction; most of them come with the tour. For further info or shopping go to www.playamia.com. The boat is right over the reef. I am completely geared up to snorkel and I can't wait to get into the water. Two panels are removed from the bow deck to unclutter a clever staircase system to get into the water… but hey, what's wrong with the old over-the-rail "Geronimo" jumping fun?! I bite my tongue quite too soon; a seaman opens the boarding gate and invites some of us to fulfill a childish wish… Geronimooooo!